Those of you looking for more info, read on. Oh! Why should you bother reading this book?!? The purpose of this book is to make you really good in answering any data lookup related question using Excel. It captures various techniques, ideas and formula concepts that are necessary to write lookup formula for almost any situation. It is more of a “how-to” book than a theoretical book. Each chapter starts with a goal or a problem and we work thru various solutions to reach our end point. Along way you will be picking up some useful Excel functions, formula writing techniques and bad humor. More than VLOOKUP or any other lookup formulas, I hope this book also enlightens you on how to think about your data problems. I believe that Excel is like a Lego kit. Creative, beautiful & inspirational stuff can only be made when you combine different pieces. If you just take a 2×2 block, you get nothing. Combine it with something else, and you just made progress. So I hope this book gives you some new building blocks that will enhance your Excel knowledge and make you even more awesome. Simple. Just visit the vlookup book page and choose the option you want. We have below variations of the book. Apart from the ebook, I also have a ebook + video book combo option. This will give you 4 hours detailed video on all aspects of lookup formulas + PDF version of the book + example Excel file. This option also gives you access to 3 bonus videos on new lookup concepts like comparison of lists, handling duplicates and using Excel 2013 data model features. This is available for $29.99. Thank you so much for your support and encouragement to Chandoo.org. Without you, I could not have written this book and published it. Go ahead and get a copy of the book. Enjoy it and become awesome in lookup formulas. Congratulations and Thank you Chandoo. I will order my copy today. Congrats on the book! I will be ordering a copy momentarily. I wanted to let you know the amazon link does not appear to be working. Hi Jordan... thanks for pointing it. My bad. Corrected the link now. Your post reminded me of "VLOOKUP week" from last year! Hope you plan a sequel to your book! I am downloading the book now. What a great accomplishment. The link appears to be working fine now. Keep up the good work. Expecting more awesome products from you. 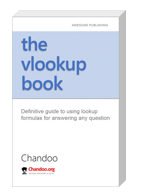 Congratulations Chandoo 🙂 Way to go..
One question though: why do you keep calling VLOOKUP formula? 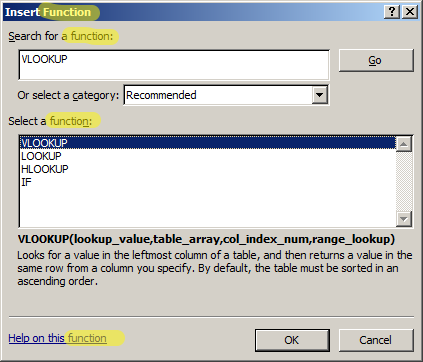 So the function VLOOKUP can be part of the formula. Congratulations, I was d/l my copy today. Glad to read, so very useful and enlighten me. I got my VLOOKUP book from Amazon yesterday and it looks like a great book! I'm especially impressed by the example file that goes with the book...extremely easy to follow, especially with the formulas shown right next to your examples. It makes it very easy to translate your examples into my real-world needs...thanks! @Stansult: It is just a old habit. When I say formula, I really mean either function or expression. Sure, that’s understandable. Just thought you might want to be more accurate with the terminology on the subject. I bought and read your book, including doing all of the homework tasks, within a few hours. I enjoyed it as you have a very engaging style, including your humorous interludes. Can I ask, though, that you proof read the book and have edition two done fairly quickly. I also think you shouldn't really be using so many merged cells when centre across selection is a much better alternative. Errors for the unwary, example, on page 31 you say the "The data is in table - Sales" but in the Excel file I downloaded it is called Sales2. I learned a few things from this book and I do recommend it. I bought the PDF version as I have tried to use Kindle versions of Excel books before and it can be difficult to match text and diagrams ... not your fault, Kindle formatting fault! Thanks Duncan for the feedback. I have fixed several mistakes and updated the kindle book a day ago. I will be making few more corrections in the next few days and once it seems final I will work with Amazon so that you (and rest of the customers) can download newer version. Bought the book in PDF format and had my first quick look; already have learned some useful tricks. Congratssss on yor new book I am going to get a copy right away....keep it up and thanks for sharing ur knowledge 🙂 I will post my review in amazon once I devour it. What is the indian price for ebook & combo version separately.? Please visit below links to get the book. Great book. Very user friendly. Just want to know, are you going to post the answers for the homework questions on your book?? Chandoo, can you share the contents of this book please? Would like to know what is covered in this book. I am looking for a comprehensive book with lots of examples on text processing. Just getting started with the book and finally today used my first successful Index/ Match formula! I have read all your posts and tried it before but something never clicked, but your book finally helped me get it. I love Powerpivot and would prefer that to "Vlookup Hell" as you have accurately described it, but my company is slow to get me updated from Windows XP (that's right I said XP!) and Powerpivot is not working great on XP. So, long story short, I need to know more lookups!